Before he spent more than 18 hours turning a slab of asphalt into a work of art, Dylan Bellerose, 20, had never worked with chalk. That, perhaps, makes the Battle Mountain High School graduate’s finished product and his second-place finish in the youth division of this year’s Denver Chalk Art Festival all the more impressive. 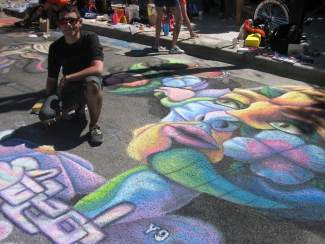 “It was a whole new experience for me,” Bellerose said of the festival, which turns the sidewalks and asphalt of Larimer Square into a veritable museum of colorful chalk art the first weekend of June each year and attracts more than 200 artists, amateur and professional alike. Though working with chalk pastels in a festival setting was new to Bellerose, creating art definitely isn’t. In high school, Bellerose created large-scale works that looked like oil paintings from afar, but they were actually made entirely of duct tape. It’s been three years since he graduated, and Bellerose is now living in Denver, focusing on becoming an artist. Recently, he was one of seven artists chosen by Arts Street, a nonprofit in Denver that creates career-advancing opportunities for young artists, to design artwork and apartment number signs for a Denver apartment building. It was Bellerose’s connection with Arts Street that led to the organization choosing to sponsor him as the lead artist of their chalk festival mural. Yu said she was impressed with his amazing work ethic. “Dylan is a perfectionist in his artwork. He was there until after dark and came back early,” Yu said. Bellerose chose to do neither. “I just like to come up with my own ideas. I like to be original,” he said when asked why he elected to create his own design rather than choosing a crowd-pleasing classic. The reason he didn’t map out his design on the pavement, however, was mostly unintentional. “That wasn’t completely on purpose. That was more due to inexperience,” he said with a laugh. He only learned about the chalk festival a few months before and wasn’t notified that he had been chosen as the Arts Street representative until a week before he was to adorn the 7-by-7 foot square of pavement. “They emailed me once about it and then that was it. Then, I didn’t know for sure until a week before it was going on,” Bellerose said. He drew inspiration for the chalk design from his previous work for Arts Street and decided to draw a female figure comprised of flowers. With that in mind, he showed up with his chalk and not much else. But Bellerose’s nonchalant style allowed for more creativity and flexibility. “Once I got going, it just took off. I wasn’t as constricted. I was just able to do whatever I wanted with it,” he said. And his two days of laboring in the hot sun paid off when he was awarded second place and $200 in art supplies for Arts Street. Yu was quick to recognize his hard work. And despite the hard work and a sunburn, Bellerose enjoyed the chalk festival so much that he hopes to do it again next year. And while he stands by his somewhat-improvised chalk technique and will probably pass on the gridlines again next year, he has learned some lessons. “I think the biggest thing I learned was to bring a lot more sunscreeen … and maybe some knee pads,” Bellerose said.